1. This home in Savannah, Georgia was created by Price Street Projects. It's sleek, modern, and bright... but what's really interesting about it is that it's made entirely from shipping containers! Hard to believe that a home this gorgeous was made from something so simple. and a long open kitchen flooded with loads of daylight. we'd otherwise throw away. These are the most amazing ones I've come across. of goods on boats and on trains. By itself, it’s pretty boring. 2. This shipping container house actually has another house built INSIDE it! 4. This Flagstaff, Arizona home was made from six containers. There are concrete floors and walnut wood accents. It's unbelievable how cozy and warm this home feels! You would never expect such modern fixtures inside an oversized corrugated box. The roofdeck is probably the best feature of all! Who knew so much was possible using such simple materials? 5. This bright and light little prefab home is like a Barbie Dream House come to life. 6. 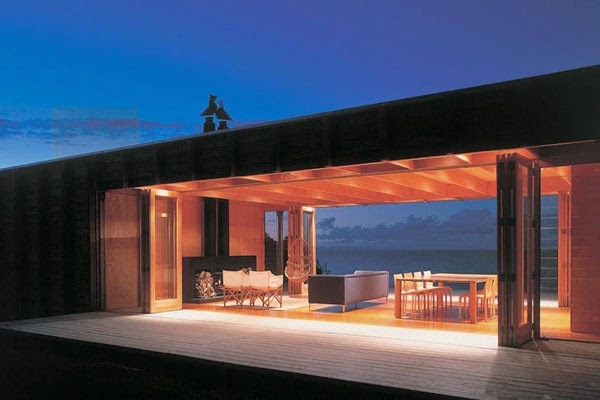 Would you even guess that the Beach Box, a beach house in the Hamptons, was made from shipping containers? 7. The Boxcar Child in you wants to live here so badly. 9. This is the woodland cottage of your dreams. 10. This cozy cabin is located in Quebec, Canada. 12. This in-your-face Chilean hillside house turns up the DRAMA! 13. The Ecopod can be on or off the grid, and is entirely made from recycled materials. 14. This house in El Tiemblo, Spain was made from four containers. It's so colorful and spacious! Designed by studio James & Mau Arquitectura and built by Infiniski. 15. This painted fancy pad by Brazillian Architect. Marcio Kogan doesn’t try to hide the containers. Instead, it lets them be the fun little 'Legos' that they are. 17. This hobbit home is able to blend into its environment. 18. The Kalkin House in Vermont knows how to make an entrance. you want to be outdoors or in. 19. The Manifesto House in Chile was built for only $118,000. want to live in the Mojave Desert. 22. This little cabin is practically a playhouse for adults. 23. This modern home in Redondo Beach is made of shipping containers. but it's way more creative than that. top to let hot air out and sunlight in. 26. This Sri Lankan holiday cabin was built on an army base, and was made from a shipping container and other reclaimed materials, including old weapons boxes and timber from old bunkers. 27. This shipping container has literally been turned into a treehouse. The best part is, these exteriors are 100% recycled, making this trend a huge step towards more environmental architecture. These homes are a perfect example of how creativity can turn something mundane into something brilliant. Share this, and inspire others to think differently about what makes a beautiful home.